Let's say you want to send a series of followup emails to customers who identified themselves as male or female or perhaps you want to give a coupon to customers that rated your customer service as poor or great. This is possible with our Bronto integration. Here's how to do it. 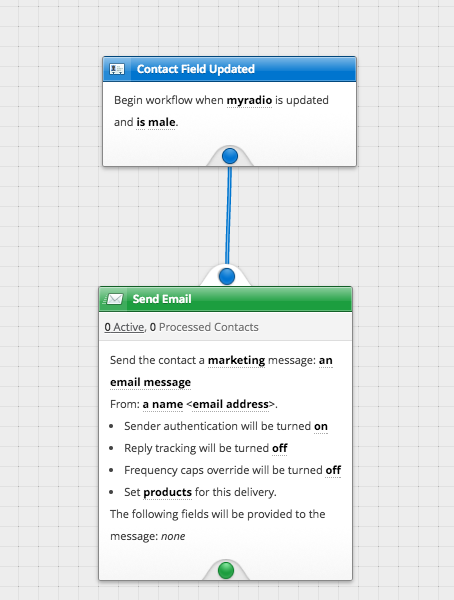 Create a Workflow in Bronto that sends emails when a custom field has been updated. The below screenshot shows an email that gets triggered when a field called "myradio" is updated to "male".